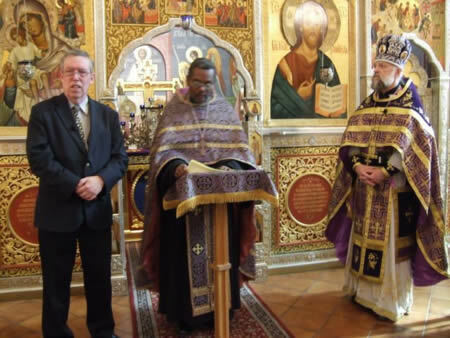 Fund for Assistance to the ROCOR - Haitian Priest Visits U.S.
Washington, DC on March, 5 2010. Washington -At the beginning of March Fr. Gregoire Legoute, one of two priests of the ROCOR mission in Haiti, and his matushka Rose spent 10 days in the United States, giving talks about the hardships of the mission. During the trip, sponsored by the Fund for Assistance, the Legoutes attended and spoke at a pastoral conference of the Eastern American Diocese in Mayfield, PA, as well as at St. Sophia Greek Orthodox Cathedral and St. John the Baptist Russian Orthodox Cathedral in Washington, DC. Fr. Gregoire described in some detail the tragic situation in his homeland, already the poorest nation in the Caribbean Basin and in the entire Western Hemisphere, devastated by the earthquake. For almost 20 years, the Orthodox Mission has been carrying on its work under the jurisdiction of the Russian Orthodox Church Outside of Russia, with 3,000 faithful gathering together in prayer at seven parishes throughout the country. The Mission operates several schools, including one of Haiti's few educational institutions for mentally retarded and handicapped children. The Mission is directed by two truly remarkable spiritual strugglers: Priests Jean Chenier-Dumais and Gregoire Legoute, through whose tireless efforts the number of parishioners is steadily growing. Despite their geographic isolation and despite pressure brought to bear on them by the former Mission administrator to follow him into schism after the reunification of the Russian Church, Fr. Jean, Fr. Gregoire, and the bulk of their flock remained under the ROCOR omophorion, and commemorate His Holiness, Patriarch Kirill, in the course of divine services. On the evening of March 5, Priest Gregoire and Matushka Rose Legoute spoke at the Greek Cathedral of St. Sophia. Addressing an audience of 200, they spoke of the difficulties in which their community finds itself. Matushka Rose's description of how traumatized Haiti's children were by the earthquake was especially powerful: now they are afraid of entering any house, and are startled by any noise. Parishioners of the Greek Cathedral donated $2,200 to the Orthodox Mission in Haiti. "...The Cross is a great gift from God, a very precious gift, which bears witness to God's boundless love... There is no proof of personal salvation for every Christian more profound than the fact that God offered Himself for each of us. The Cross is the most powerful weapon against the devil; whosoever has the Cross, the Cross living in his heart, need fear nothing... Following after Christ, we move toward Passion Week, toward Pascha, carrying the Cross of our Lord. Here is the essence of Great Lent: 'Whosoever will come after Me, let him deny himself and take up his cross and follow Me.' (Mark 8:34). Do we realize what we are doing when we bow down before and kiss the Cross? Does our internal state correspond with our external behavior?" Fr. Gregoire's words made an enormous impression upon his audience, for they were spoken by someone who by God's will was carrying, and will continue to carry, his Cross, not in theory but in actual fact, the extremely heavy Cross of spiritual and physical trials in Haiti. On March 7, in collections taken up at the two Liturgies, our parish donated $13,000 to the Haiti Mission. In 2010, our parish has donated $31,000 to the Mission in Haiti. On Monday, Priest Gregoire, Matushka Rose, Archpriest Victor Potapov (in his capacity as Executive Director of the ROCOR Fund for Assistance), his assistant Alena Plavsic, and Priest Matthew Williams, assistant to the Administrator of the Ecclesiastical Mission in Haiti, attended a meeting in Baltimore at the headquarters of the International Orthodox Christian Charities (IOCC). The ROCOR Fund for Assistance, in cooperation with the IOCC, extends daily humanitarian aid to the Ecclesiastical Mission in Haiti. According to Fr. Gregoire, first and foremost among the needs of the Mission is a church and parish hall. Both charitable institutions promised to help Fr. Gregoire in all ways possible in the work of restoring church life in Haiti.